Gold jewelry is valuable no matter how many karats it contains. But a little known fact is that gold is a soft substance, and not ideally suitable for durable jewelry. To overcome this problem, gold is often mixed with additional metals. Copper, silver, zinc, and nickel are sometimes used to strengthen gold. This is important to know when shopping for any type of gold wedding ring. A "karat" represents the amount of pure gold in a piece of gold jewelry. And a "carat" represents the weight of diamonds and other precious metals. 24 karat gold or 24k, is 100% pure gold. This is too soft for the wear and tear that gold jewelry must take when it is worn. 18 karat gold, or 18k gold, is 75% gold but much more durable for gold wedding rings and gold jewelry. 14 karat gold or 14k gold is 58% gold are again more durable for gold wedding rings or other gold jewelry that is meant to be worn every day. Why are 18K gold wedding rings less expensive than 24K rings? As mentioned above, a ring’s karat signifies how much pure gold the piece includes. 24k gold wedding rings contain gold in its purest form. Or in other words, 18k gold wedding rings contain slightly less gold than the 24k gold wedding rings. The lesser amount of gold in an 18k wedding ring makes the ring less expensive than the 24k gold wedding ring. However, that doesn’t necessarily mean the smaller karat ring is less valuable. Gold is actually a soft metal. And it’s usually too soft to create a sturdy piece of jewelry. But when additional metals are added to the gold, it becomes more durable. If you see a ring which is 18k, 14k, 10k and so on, that means the ring contains less pure gold. This information is very important because it affects the price of the ring. The karat should be listed on the inside of the ring’s band. 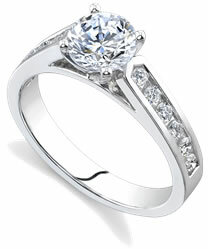 And if you’re shopping online, the ring’s karat is usually listed with the ring’s information. So what does all this mean? It means 18k gold wedding rings can actually last longer, and withstand daily wear much better than 24k rings. So it’s important to not judge a ring so much by its price. Instead, think of the durability of the ring. Your goal is not to simply find the most expensive ring you can afford. Your goal is to find a wedding ring that will last a lifetime. And 18k gold wedding rings are a good choice. Why Should I Consider 18k gold wedding rings when I can afford more? The most expensive ring isn’t necessarily the best ring. 18k gold wedding rings are high quality, and the industry standard. Because higher karat rings are softer and more pliant, they are also more likely to be damaged and scratched during daily wear. You’ll want to wear your wedding often, if not everyday, so a more durable gold is desirable. Novori generally does not make 24k wedding rings unless a customer specifically requests it. Sure, 24k costs more than smaller karats, but the ring may spend more time getting repairs than on your finger. Is there a big difference between 14K gold wedding rings and 18K gold wedding rings? As stated earlier, a larger karat means there’s more pure gold in the ring. So 14K gold wedding rings contain at least 58% pure gold. On the other hand, 18K gold wedding rings contain at least 75% pure gold. So 18k gold wedding rings can be the perfect choice – they’re not as soft as 14k and not as expensive as 24k rings. If you still need help deciding which ring setting is best for you, or need assistance selecting the perfect diamond, give us a call at 1-877-877-4141. We are always here ready to help.